December 15, 2003: Almost eight months after launching the iTunes Music Store, Apple celebrates its 25 millionth download. The iTunes Music Store circa 2003 offered what seems today a comparatively paltry music catalog “of more than 400,000 songs,” priced at 99 cents each. These came from all five major music companies and more than 200 independent labels. Apple also celebrated selling more than $1 million of iTunes online gift certificates and top-up allowances since introducing them a couple of months earlier in October. What was your first iTunes song download? Leave your comments below. * – At the risk of being persnickety, Apple’s press release claims that the “Let It Snow! Let It Snow! 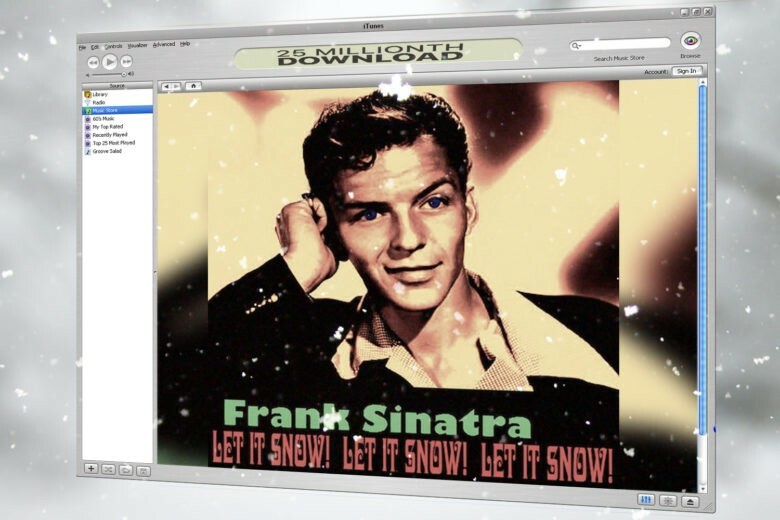 Let It Snow!” download was a version by Frank Sinatra. While Sinatra did record a May 1950 version of the song, which appeared on the 2002 Christmas With the Rat Pack album, the far more famous version was sung by Sinatra friend and stablemate Dean Martin. Not sure if Apple made a mistake here!